Usually when I see Thanos’ name thrown around, it’s accompanied with titles such as “The Mad Titan” or “Avatar of Death”. So when Thanos Rising was announced, it was Jason Aaron and Simone Bianchi’s chance to introduce us to the villain making its rounds on the film side of Marvel. This team has set out to make Thanos more sympathetic, detailing the journey it took to create a villain in a more tragic light. Unfortunately, it seems that there is such a thing as being too sympathetic, as this first issue mostly fails to capture the spirit of a killer. 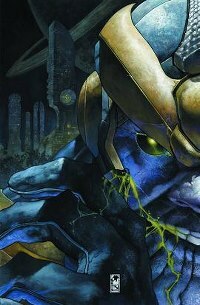 Thanos Rising #1 kicks off with the birth of Thanos himself, as his first moments in life are his own mother trying to kill him, then jumping forward to his life as a teenager. Seeing Thanos as a teenager is jarring- this is a man who conquers entire worlds and kills millions of people – but at the moment he’s a soft spoken artist. It seems that some of the appeal of this super villain is lost when you begin to pull away the layers to find an child who has a penchant for not harming animals. That said, Aaron does manage to fit in some truly disturbing scenes into this first issue. The scene where Thanos recounts a reccuring dream to his mother of how she is trying to kill him, while she sits in a straight-jacket, is particularly memorable, as well as a fairly gruesome scene later in the book when Thanos discovers his friends massacred, thanks to Bianchi’s art. It does sow seeds for what is likely to come, but right off the bat it isn’t enough. Bianchi’s art is a mixed bag. In the aforementioned scene it is particularly fantastic, but some of his character work leaves something to be desired. Faces appear flat and wide, and the children all have the exact same stereotypical body shape of small body and big head – Thanos included. It’s an odd choice of artist, whose work appears more surreal, and perhaps the story would have benefited from more realistic looking art, but we’ll see how this plays out over the next four issues. The intent is clear in Thanos Rising #1, and the talent is more than capable of delivering on such a promise, but the execution leaves much to be desired. However this is only the first issue of five, and Jason Aaron has proven himself in the past, so I’m willing to give the benefit of the doubt. Let’s just hope it can find its footing soon. As someone who isn’t really familiar with Thanos as a villain, I definitely got an odd vibe for this book. It feels similar to how they handled the Star Wars prequels, with making the man behind the mask of Darth Vader a bit of a whinny spoilt brat. I’ll defend the Star Wars prequels to death, but I even acknowledge the representation of Anakin as weak. I always pick Thanos as cold and evil, so it was weird seeing him as a gangly little kid. I hope that Thanos Rising can distance itself from these more sympathetic moments and make it more Shakespearean and less Star Wars.